If you have been using the stock iOS 7 music player like most people out there you more than likely are happy with everything it brings to the table. A sleek minimalistic feel that blends in seemlessly with the iOS 7 overhaul that is now the norm. But what about an alternative that does everything the stock app does but then gives you the ability to stream up to 20,000 songs directly from your home iTunes library for free? Well thats exatcly what the new Google Play Music app for iOS 7 does and boy does it make you question why your using the regular music app after you get it up and running. When you read what the Google Play Music app brings to the table, mainly the 20,000 song streaming from your personal library for free, you almost think "Ok where's the catch?". There honestly isn't a catch or gotcha moment anywhere in the app at all which is a huge welcomed change with apps in general nowadays. The setup is super simple and streamlined. All you need to do is have your iTunes library on hand at your computer and download the Google Play Music desktop app which uploads your entire iTunes library to Google's cloud service. Depending on how large your library is this should take anywhere from an hour to a few hours at the most. Once the upload is complete your ready to get going with the app itself on your iDevice. Simply open the app and login to your Google account and your entire iTunes library, up to 20,000 songs, is available for full streaming at no cost. The benefit of this is huge especially for people with iPhones and iPads that have the small 16gb storage option. Even individuals with the larger 32 and 64gb models can fill them up quickly with how large iOS apps can be nowadays so this is a complete game changer in that regard. You no longer have to worry about setting aside a certain amount of space on your device specifically for your music. Using the app itself is very easy and quick to learn. Easy to read tabs and convienient swiping gestures are the the main things you come away with after using it for just a few minutes. You can still create playlists on the fly and of course sort your music library by genre, artist, song and album. You can even pin a song or album to store locally on your device when you may be in an area where you dont have the greatest service. Some may think the streaming option will degrade the quality of the music but that is anything but the case after our extensive testing with the app. You even have the option to choose the quality of the stream. Even on the mid level streaming quality setting the sound is good enough for just about anyone out there. If your a music lover and listen to music on your iDevice as much as most people who commute to work or school everyday this latest app from Google is a must download. Theres no catch, you pay no fee and you will have your entire music library with you at all times thats to Google's stable and quick cloud service. Its a wonder why Apple hasnt included something like this in their stock music app with their only competitor being the iTunes Match service that basically does the same thing but comes with a $24.99 annual price tag. Take notes on this one Apple because Google is beating you in this regard when it comes to a great music app that does more than just play locally stored songs. 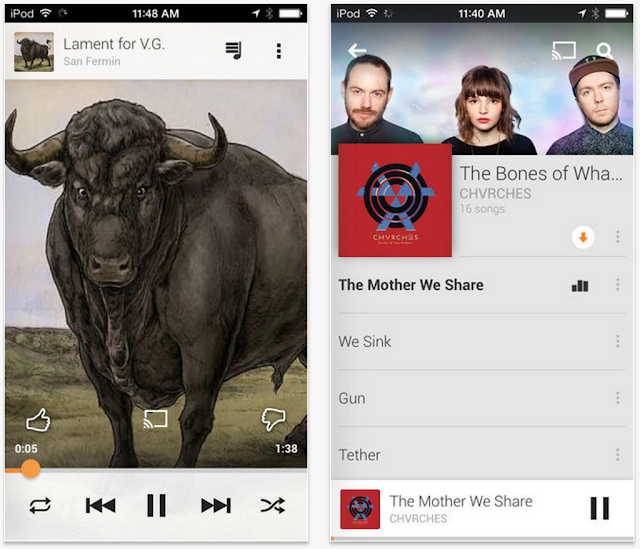 You can pick up the Google Play Music app for iOS directly from the App Store here.